If you've paid attention to the cost of televisions at all you'll have noticed that you can get a bigger TV for less cost. The first TV I bought was a 19" CRT for about $250 around 15 years ago. If you factor in inflation that 19" TV should cost $350 but I can find a 24" flat panel HDTV for around $200. Over that 15 years, the costs have gone down 1.5% per year while inflation has been about 2.2% a year. If you look back further to the 1950's when TV's first became common the prices were even higher. A typical 19" color TV in 1956 could run $495. Adjusted for inflation that would equate to paying $3,944 in 2010 dollars. But remember a similar size 24" flat panel is just $200 today. The 24" TV of today costs about 5% of what people paid for a 19" color TV in 1956. Plus of course the HDTV set of today has a much better picture quality than the 19" tube model from 1956. Lets look at it compared to income levels. If you had bought that 19" RCA TV in 1956 then the $495 cost would be a very sizable chunk of a typical family income. In 1956 the median family income was $4,780. So you'd be spending about 10% of a years income on your TV set. By 2007 median income had hit $61,355 so a $200 TV purchase was relatively small expenditure by comparison at just 0.3% of annual income. 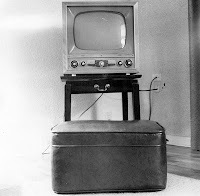 In terms of median family income levels the purchase of a TV set today has 3% of the cost of a set in 1956. Of course most family TV's are not smaller 19-25" sized models. Many if not most families buying a new TV today are likely to splurge for a big screen TV. But even then we're paying less of our money to buy the big TV's today as we did in the 1956's. Say you spend $1400 on a 52" LCD HDTV set. That would be 2.2% of the median family annual income. The 52" flat screen of today costs about 1 / 5th of annual wages of what a family spent to buy the 19" color sets in 1956. No matter how you cut it, Americans are spending less today to buy their televisions then they did in the past and we're getting bigger screen size and higher quality televisions at the same time.